In my previous post I discussed why I reject the Fundamentalist understanding of infallibility, which as I discussed is very different from how Boyd understands infallibility. In this post, I’ll begin by explaining why I, in contrast, agree with Boyd’s re-imagined Christ-centered understanding of infallibility. I will then discuss inspiration, authority, and what it means to make Christ the center of how we read the Bible. From this I take it that Boyd sees infallibility as meaning that God is somehow active in Scripture, using it to lead us to Christ. Scripture (or more precisely, God active in Scripture) is unfailing in doing this, and thus infallible. As Boyd says above, affirming this does not mean that we should not question violent portrayals of God, nor does it mean that everything is of equal weight or validity. The question of course is then, how does Scripture do this? How does a text which contains “violent divine portraits that conflict with the revelation of God in the crucified Christ” lead us to Christ? The answers that Boyd and I give to this question are different. I will consider our two differing answers to this question in my next post (part 3). Right now I want to simply note that Boyd and I are in agreement that Scripture—when it is interpreted rightly—leads us to Christ and his way of cruciform love. If that’s what infallibility means, then I apparently believe in infallibility, too. Now, I don’t think I will be adopting the term “infallibility” because for me the term is historically tied to Fundamentalism, and as I said, I am not a Fundamentalist. I am however sympathetic to why Greg might want to redeem the term. We all do that at one point or another. There are some who reject the term “Christian” because of its negative associations, instead calling themselves “followers of Jesus” and such. I instead want to redeem the word “Christian,” showing that it should be associated with Christlikeness. I also want to redeem the term “inspiration,” showing how it works in the context of Scripture’s ultimate purpose being to lead us to Christ. I present that definition in the final chapter of Disarming Scripture, drawing on the of of Stanley Grenz. So I really do appreciate what Greg is trying to do here by re-defining infallibility. I just don’t think it is fair or particularly charitable to fault me when I do not feel the need to redeem the same words that he does. At the very least, what we need to look at is the content of what we each believe and affirm, rather than focusing on affirming particular words. How Boyd takes my above statement advocating humility and self-reflection, and from this declares that I am therefore saying that Scripture is “not inspired” and can just be tossed out, is frankly baffling to me. Again, the first sentence is true (note that he can give a page reference). I do say that we should wrestle with the text (and I might add, so does Boyd). In the second sentence however Boyd is once again putting words in my mouth. Let’s take a moment to consider the notion of “authority.” What does it mean for a biblical text to “carry divine authority” as Boyd puts it? That all makes sense as far as the Supreme Court goes, but completely falls apart when it is applied to how Boyd proposes we should interpret Scripture. 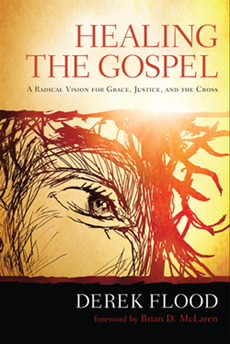 Boyd maintains that we should reject violent interpretations, while at the same time he fully recognizes that many parts of the Old Testament texts themselves contain “violent divine portraits that conflict with the revelation of God in the crucified Christ” and thus present us with an inaccurate portrait of God’s true nature revealed in Christ. This is not a matter of interpretation, of us somehow reading it wrong. It is simply what the texts actually proclaim and promote. The only way Boyd can get around the fact that these texts themselves contain morally disturbing content intended by the biblical author is to propose that we interpret a text in a way that is intentionally opposed to the way the biblical author intended it. Now, try and apply that to the Supreme Court: Imagine how chaotic and dysfunctional the Supreme Court would be if each Supreme Court justice sought to interpret the Constitution in a way that was intentionally counter to the intent of the Founding Fathers. If there were a way to get fired as a Supreme Court Justice, I’m pretty sure this would be it. So at the very least the analogy of comparing the authority of Scripture to the way the Constitution functions completely falls apart here. Conservative biblical exegetes who are exclusively concerned with authorial intent, completely detached from ethical concerns, might be comparable to the Supreme Court, but not to the approach of either Boyd or myself. That is what I am saying, and—despite the apparent confusion between us—I think it is what Boyd is trying to say as well. Repudiate. Let’s look that up in the dictionary: It means refuse to accept or be associated with. Deny the truth or validity of. So, following the lead of Jesus and Paul, we should repudiate and go against violent passages, but we can’t reject them? At this point I honestly became a bit confused. Boyd maintains that in the light of Christ, we must reject violent interpretations of Scripture, and simultaneously that Jesus and Paul never felt free to simply reject any portion of Scripture? How does that make any sense? So what might Boyd have then meant? Trying to view his position in the most generous way I can, I assume what he was trying to say is that we do practically need to reject, repudiate, go against (in the sense that they are not normative for how we see God or how we treat one another, which is to say that they are not normative at all) texts which are in conflict with the revelation of Christ, seeing them as not carrying the same weight and authority as the way of Jesus, but nevertheless still should seek to wrestle with these morally problematic texts to understand how they can then function as part of our sacred canon. Both Boyd and I seek to do this, albeit in very different ways. In my next post I will discuss our two approaches. What I have attempted to accomplish in this post is to show how what Boyd finds so alarming (that I am supposedly “severing the tether” with the historical faith by denying the Bible’s inspiration) is simply not true. In fact I think we agree more than most on these things. I hope that Greg can give me the benefit of the doubt on that. "But Boyd pushes this even further, claiming that I advocate just tossing out anything I don’t like"
That may not be what you intended but that was how I read you. I saw nothing said about things that do not seem to demonstrate love should cause us to back out of our current interpretation and try again. Well said Derek. I appreciate Boyd and his work, but I think that he’s caught himself in a few contradictions here. It does seem that much of what the two of you are talking about is the nature of the Bible, specifically how to define “infallibility” and/or “inspiration” and how such concepts relate to “authority”. Taking Boyd’s own definition per “Benefit of the Doubt” (referencing the quote that infallibility is “to point us to Christ and help us to cultivate a relationship with Christ, then so long as we remain confident that the Scripture doesn’t fail to do this – in this sense it is ‘infallible’”….) is, to me, utterly unhelpful. If “infallibility” is defined purely in terms of “results” (leading us to Christ), then it doesn’t speak to the nature of the text itself AT ALL. The text itself could be anything. These “infallible” results could be the same whether the text itself is the inspired journey of a changing and growing (and at times errant) faith that culminates (and is subverted) in Christ, or the literal divinely dictated Word of God. That’s fine if that’s what he means, but that doesn’t seem to be what “infallibility” implies – it’s a significant redefinition. I might suggest, though, that Boyd seems primarily concerned with how the book might be received by a conservative audience – an audience that holds to the traditional (though debated) definitions of inerrancy and infallibility. (I’m getting that from his comment that your approach won’t “persuade many dissenting scholars”). Ultimately, he’s not willing to concede that an “infallible” Bible demonstrates and proves a violent God. To do so would be to admit defeat. I’ve heard many, many times (from Christians) that Islam is inherently violent as plainly presented in it’s sacred texts (not arguing either way, but just using it as an example). If someone within Islam wanted to refute that violence by addressing the violent texts, there’d only be a few options to do so (which might have sub-options underneath them). Either (1) the texts don’t mean what they plainly say, (2) they do mean what’s plainly there, but they don’t apply anymore for any number of reasons, or (3) the texts are wrong. All 3 have their own set of challenges for sure. But if the starting point of True Faith is an inerrant/infallible timelessly true sacred book that requires only objective interpretation (the key point) then ditching that infallibility as the ONLY way to avoid violence would seem to actually prove the point that it is inherently violent. And from a Christian standpoint, I think that Boyd is trying to avoid this conclusion. Those same scholars that may not like your approach, however, are very likely not going to like Boyd’s definition of infallibility. Ultimately, I’d argue that the mental and theological gymnastics surrounding the cherry-picking, “text trumping” and explaining away violence and/or the historical challenges in the Bible (which are exhausting) are functionally the same thing as ditching “infallibility”. There is always picking and choosing going on (explaining away the things that aren’t liked through sophisticated scholarly loopholes because they don’t fit within the jigsaw puzzle), even if one hides behind “infallibility”. But for many, infallibility is vitally connected to verbal plenary inspiration which is vitally connected to and the cornerstone of whether True Christianity stands or falls – so the word must be kept even if it functionally doesn’t do much. Slippery slope and all that – and I’ll admit that I struggle with that A LOT. Boyd, you, and Jersak are my favorite theologians. I love Dr. Gregory Boyd, but he's trying SO HARD to keep his "evangelical card." In an attempt to remain credible with his evangelical scholars, he's slipping on his logic. I still love him to death though. It seems every book Boyd puts out is like A COMPLETELY NEW IDEA, but man I loved "Disarming Scripture" and your "scientific hermeneutic" as I like to call it. This hermeneutic has originated with gay Christians such as Justin Lee and Matthew Vines, and it is SO SOLID in a scientific world as the one we live in. I love your thoughts and teachings Derek Flood!!!! I see the 6th paragraph and the 3 following paragraphs of Boyd's 3rd post to be his most important critique of Derek's books. The paragraph I am talking about begins with "Second I believe Flood's conception...". This has been a critique of mine ever since I finished reading both of Derek's books and I intended to raise it but Boyd said it better than I ever could. Derek did not seem to embrace other positive characteristics of neighbour love in the NT like joy, peace, longsuffering... My take is that this was simply an oversight or something I might have missed and that Derek would affirm such in the NT. Yes! Like I said on the previous post, I was completely baffled by his review. I just don't understand how he could have *misread* you so badly. Going against vs. Rejecting may make more sense if Boyd is concerned you are tossing out scriptures that you don't like vs what he sees as Paul reinterpreting those passages in a different light. His main concern is interpretation. Where as he evaluates you as saying that we can throw out scriptures that are whatever (violent, opposed to Christ suffering sacrifical love). This is the rub. Boyd is concerned with leaving all the text in and reinterpreting the violent passages. Where as you seem to be arguing that Paul rejects passages from the Bible. Very different approach than Boyd. I don't know what specific examples might be referenced, but it seems that "reinterpreting" in a way that completely repudiates the meaning of a text is not, in fact, "reinterpreting" at all. If "repudiating" it - effectively taking passages to make them mean something completely different - still permits infallibility, then I don't know what a fallible Bible would even look like. Any passage can be "creatively" reinterpreted if the desire is to sustain "infallibility". I don't see much of a difference in approach at all. Also, I think highly of Boyd. "That may not be what you intended but that was how I read you." 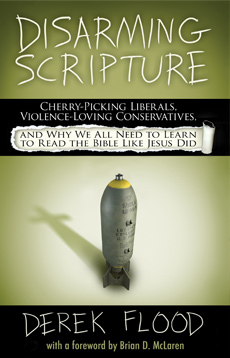 Have you read my book Disarming Scripture? I don't know how one could honestly get that impression from it. I say of the NT frequently that “If we therefore recognize that a particular interpretation leads to observable harm, this necessarily means that we need to stop and reassess our course." Wow man, I think you nailed it. Really insightful post! I do think that there is a lot of these words being used to say " look, I belong!" to certain gatekeepers, but the words are used in ways where the definition is changes so it really means something entirely different to the gatekeepers definition. Personally, I'd rather avoid these words and instead speak of the communicate the content of what we are saying clearly. Also I don't like gatekeepers. In regards to my appropriation of the scientific method, perhaps I will discuss that in a later post. Juan, yes I was honestly surprised by that too. Yes, I get into that in more detail in part 3. Perhaps you can define what you mean by "too subjective"? You do realize I hope that looking to the Bible in no way is objective, right? Authoritarian and objective are not the same. I say that we should read the Bible and look to see that our application is not hurtful. So I don't know where you get that I would "not pay attention" to commands in Scripture. What would the alternative to that be exactly? Ignoring when things are hurtful and doing it anyway because the Bible says so? Would that be "less subjective"?